Since the advent of social media we have hardly used this news page so we've decided to retire it. Of course, we have not deleted any of the old news (we are archivists!) but all our new news is now published either on Facebook and Twitter (brief news items) or on our blog. Please see the links below. Our really old newsletters (in .pdf format) can be found here. This collection was originally amassed by Mrs Margaret Evans whose displays in the old railway station buildings and in 'Enoc Huws' shop were enjoyed by the people of Aberystwyth and tourists for many years. The collection included costume, artefacts, documents and ephemera associated with nineteenth and twentieth century Aberystwyth (and often beyond! ), with many items donated by people of the town. The collection was left to the County Council, and the paper items came to Ceredigion Archives, whilst artefacts went to Ceredigion Museum. The Archives collection comprises numerous diverse items, mostly ephemeral in nature. Any original order to the documents was lost many years ago, so our approach has been to arrange the items thematically. You can browse the collection by theme or undertake a simple one-word search to seek for specific items. We are gradually cataloguing the collection, so more items will appear on this site over time. Over the last 7 months we have been working on the Access to Our Past project to make more of our archival holdings readily accessible to our users. This project is the latest in a series of improvements made by Ceredigion Archives over the last two years. It follows on from Making the Move, an earlier project to conduct a full audit of our holdings prior to our relocation. An exhaustive check of every box in the archive was made, ensuring that we had accurate records of all our collections, and that they were complete and properly stored to aid their permanent preservation. 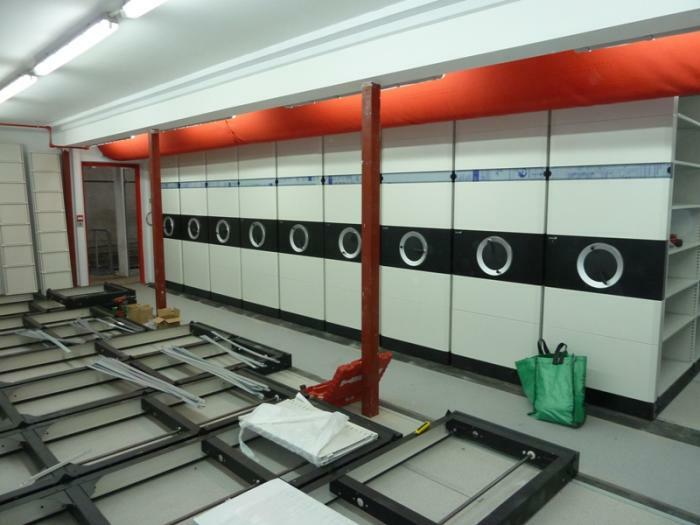 This helped us to organize the removal of the archives from the iconic yet highly unsuitable repository in Swyddfa'r Sir, (the old Queen's Hotel) on Aberystwyth seafront to our new high standard premises in the recently refurbished Aberystwyth Old Town Hall. It also highlighted the need to update and improve our catalogues and website, and this is what Access to Our Past project was devised to address. To date approximately 950 new catalogues have been made available, with more on the way. Over 200 old catalogues have also been re-formatted with another 440 lined up to be done. Our website has been upgraded with the new search engine, which is far more reliable than our old one, and the new administrative functions, which considerably speed up the process of getting new catalogues available online, up and running. We would like to thank Drew Westerman, our project officer, for both Making the Move and Access to Our Past. Drew came to us immediately after qualifying as an archivist at Aberystwyth University, having gained some very useful pre-course experience in auditing collections at West Glamorgan Archives. A self-confessed geek, he has brought his astonishing patience and huge attention to detail to every stage of both of these projects. In both Making the Move and Access to Our Past he has been the principal facilitator of change and improvement, helping to create the archive service we enjoy today. For Access to our Past many thanks are also due to Nigel Callaghan of Technoleg Taliesin who listened to our demands and worked with us to make our website better for our users world-wide. Further thanks are due to Ceredigion County Council's excellent and forbearing translation and I.T. services for their work in realizing our vision. We are also deeply grateful to CyMAL for providing advice and grant-funding for both of these projects. Without its support neither would have been possible. We have moved and re-opened! Ceredigion Archives has now re-opened to the public in our new home, Aberystwyth's old Town Hall in Queen's Road. Please be patient while we deal with the odds and ends of moving and adjust to our new workspace. Our opening hours are now back to normal. More news and pics coming soon. After a (perhaps inevitable) delay, we will be relocating to the new premises in April. Our current restricted opening hours (see below) will continue until the end of March. We will then be closed to the public throughout April and we hope to reopen early in May. Watch this space! Early in 2012 Ceredigion Archives will be moving to the old Aberystwyth Town Hall (which may have a new fancy name by then!) which has been converted for use as the new County Archives building, Aberystwyth Library, and Aberystwyth Day Centre. 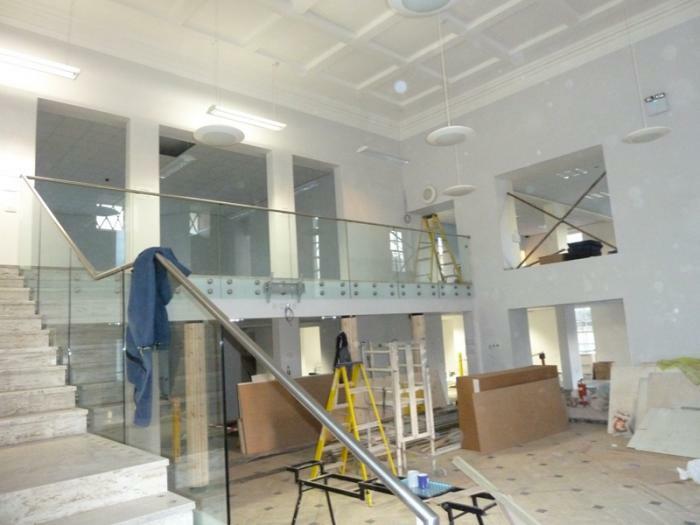 The new search-room will be on the first floor of the building, accessible by stairs and lift, and situated only a few metres from the local history section of the library. 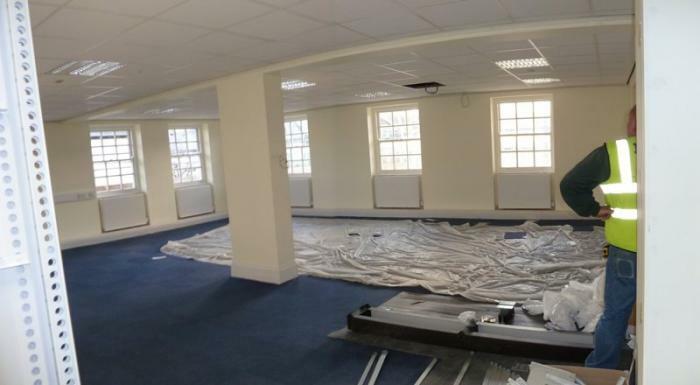 The strong rooms are situated to the rear of the building on the ground floor and the first floor, and they have been specially fitted out to be compliant to BS5454, the British Standard for the preservation of archival material. 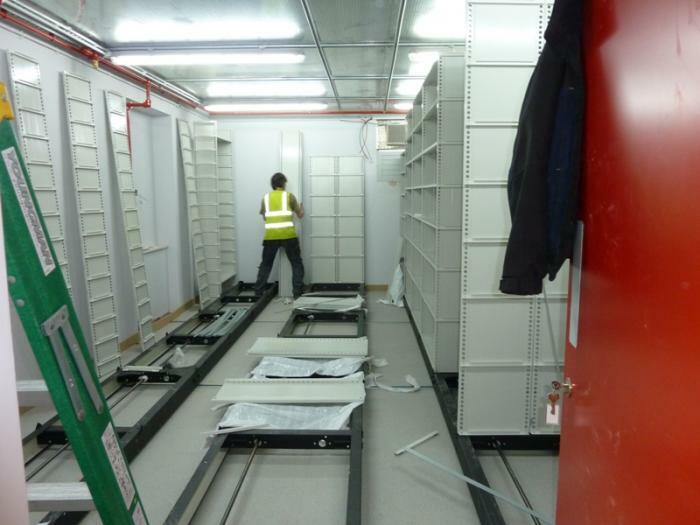 The strong-rooms have mobile shelving throughout, and a gas fire-suppression system. As I write the search-room is still under development, but we hope to have three public access computers in addition to the old microform machines. We will still have a big table for searchers, and map cabinets for easy access to the most popular maps. We have rescued some oak bookcases from the original Town Hall building and hope to use those for our reference collection. We will still have lovely staff to help you with your requests (everyone except Anne Martin will be transferring to the new archives; Anne has recently retired) and we look forward to welcoming you to the new Ceredigion Archives in the Spring of 2012. Watch this space for further details. We are very happy to announce that the Ardwyn School Collection catalogue is on-line at last. The detailed and exhaustive catalogue was prepared about a year ago by Peter Lewis (then a newly-qualified archivist) but it has taken a while to prepare it for web-mounting. Ardwyn school (Aberystwyth County School) provided secondary education in the Aberystwyth area from 1896-1973, when re-organisation created the two current secondary schools Penweddig (Welsh medium) and Penglais (English medium). The collection was deposited by Dr. Huw Spencer Lloyd whose book The History of Aberystwyth County School (Aberystwyth 1996) provides a comprehensive introduction to the subject. For further research we commend readers to this collection. We are delighted to announce the arrival of Phase One of the Aberystwyth Building plans catalogue on our website. The work is not yet complete but we thought that enough of the collection has been catalogued to warrant making it available to researchers. We would like to thank our valiant army of volunteers and trainees past and present, Matthew, Jake, Gary, Hannah, Zbigniew, and Liz, for their sterling work on the project. Aberystwyth underwent a period of expansion and rebuilding in the late 19th  early 20th century. 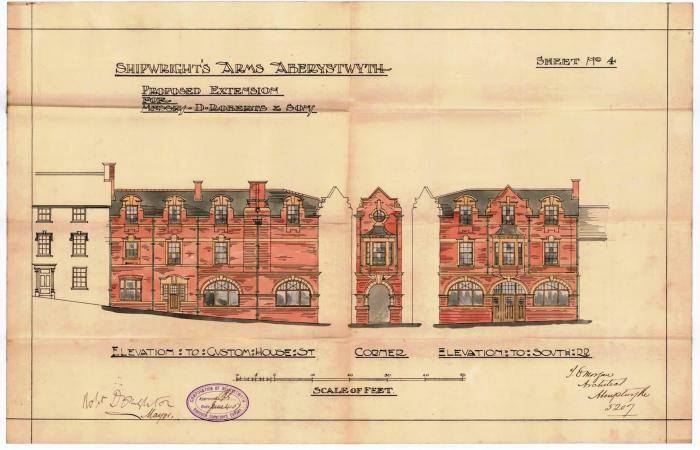 Even though planning laws were less stringent then than now, one still had to submit an application, accompanied by a plan (usually drawn by an architect) to the planning authority - Aberystwyth Borough's Building Control Department  for approval. Many of these plans have survived and a list is now available. They range from plans for entirely new houses  such as the Edwardian red brick terraces around Stanley Road  to extensions, new bathrooms and even a 'conversion of stable into a motor garage'! When a plan was submitted, it was entered in a ledger under the name of the street (or sometimes area) where the proposed building was to be located. We kept this arrangement; it allows for expansion (were further plans to be discovered) without compromising the structure of the catalogue. The catalogue entries show the new reference number which incorporates (after ABM/BC) the first letter of the street's name as it is now, and also the letter/number combination it bore in the ledger. If the street letters do not match, it is usually because the street's name has changed, sometimes more than once. The number of the house is not always given but we hope to match the plans to the present-day house numbers and names one day. Follow this link to see the catalogue. We are delighted to announce our new website search facility. You might have noticed that the old one was a bit quirky  or maybe you got no search results at all? The new engine should be a big improvement. 3) It's a bit odd with 3-letter words - it actually picks up words starting with the term e.g. 'cat' will find 'cataract'. 4) Default option is only to search for entries that match all the words entered - option to match any is available. 5) The filter for 'search specific set of collections' has been removed for now but will return in due course. 6) Words in search terms with 1 or 2 characters are ignored completely. 7) The accession register searches now highlight matches. Please do send us your comments and suggestions! Emrys Prosser Collection is online! The full catalogue, prepared by project archivist Jennie Hill, is now on-line. This important collection contains Mr. Prosser's personal papers, his local history research and a number of slides. He acquired some papers of W. Ronald Williams, solicitor, Argoed Hall, Tregaron; these are mostly title deeds of local properties. The collection also contains business records of John Williams, Rhydyronnen, Tregaron and a quantity of material relating to Capel Bwlchgwynt (Wesleyan Methodist), Tregaron. You can find it in the Other Major Collections section of our on-line catalogue. Bees are in the news - and now in our catalogue! We have been listing documents which relate to bees and beekeeping. They are a part of the Gwilym Evans/Welsh Plant Breeding Station collection. The introduction and link to the catalogue can be found here. The Hywel Watkins/Dinas School collection is now on-line. You can find it in the Other Major Collections section of our catalogue. We have recently acquired some interesting documents from the Lampeter area which we are listing as the David Lloyd Solicitors (DLL) collection. The collection appears to consist of professional papers of the solicitors firm David Lloyd and Son, Lampeter. Members of the family include David Lloyd, J. Ernest Lloyd and William Reginald Lloyd. In addition to running a law practice the Lloyds served as solicitors to Lampeter Borough and as Town Clerks. D. Lloyd was Clerk to the Guardians of the Lampeter Union and also Town Clerk. J. Ernest Lloyd served as Mayor of Lampeter and also Town Clerk. The documents reflect these functions and include borough records of street improvements and building works, elections etc. ; churchwardens' reports; tithe collection records; records relating to the Manchester and Milford Railway, and the proposed New Quay Light Railway, and various other papers. Some of the records relate to Carmarthenshire. Work has begun on listing the collection which will be available when the short catalogue entry appears online in a week or two under 'recent acquisitions'. We welcome the return of a special collection to Ceredigion Archives. The Florrie Hamer Collection (Accession 1102, ref. no. ADX/415) has been in the Conservation Unit of the University of Dundee undergoing repair work. The Collection consists of scrapbook folders compiled by the late Miss Hamer who was a lady's companion, and mixed with many of the gentry families of North Ceredigion in the middle years of the twentieth century. 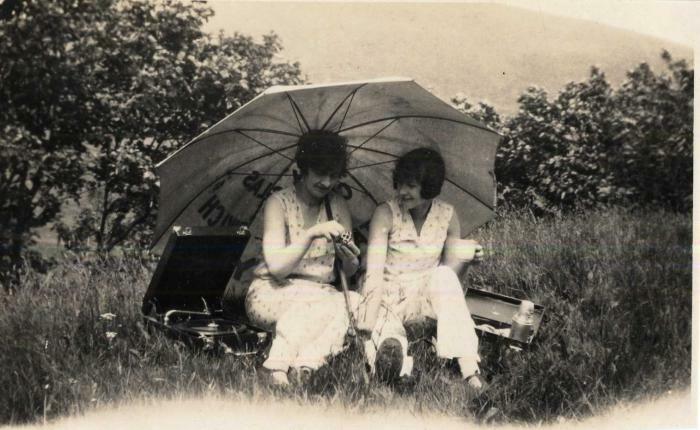 Florrie's caption: Ellen Hughes and Florrie Hamer, 'Picnic on the lawn', Pendinas in the background. 1933. In her later years she compiled scrapbooks which included letters from the Pryse family of Gogerddan, to whom she was particularly close, her own local history notes based on her memories, photographs, ephemera and local newspaper cuttings. We were delighted to receive funding from the National Manuscripts Conservation Trust which allowed us to have part of the collection professionally restored. The scrapbooks, sticky tape, and felt tip pens which Florrie often used present particular challenges for long term preservation. The conservation work is of an excellent quality, and we hope that this, and careful handling by researchers, will help preserve this fascinating collection far into the future. Hafod Estate collection catalogue now on-line! This major collection is now included in our catalogue. Introduction and link are here. An on-line exhibition of documents from this and from the Friends of Hafod collection is coming soon. The Ceredigion Archives website has been live for over four years now, and we felt it was time for a bit of a facelift. You can still search through our catalogue on-line, but it is now much easier for us to add new descriptions. We now have an up-to-date list of recent additions to the Collections. We would like to thank Nigel Callaghan for all his hard work in improving the website; we hope all the new tweaks and features will enable us to supply you all with lots of new and up-to-date information about the service! We also have the structures in place to let us add much more on-line material in the future - digital copies of pictures and documents - as well as 'exhibitions' on particular themes. The catalogue of this extensive collection, prepared by the project archivist Helen Rowe, is now online. You can read the introduction and find the catalogue link here. We welcome Patrycja Duszynska to the office as a trainee. Patrycja works with us part of the week, and at the University of Aberystwyth Archives and Records Management department on other days. We are pleased to announce that the office is open for five extra hours per week - we no longer close at lunchtimes. New opening hours are 10am-7pm on Monday, 10am-4.30pm on Tuesdays and Wednesdays, and 10am-4pm on Thursdays and Fridays. If you have a genuine interest in archives and have some time to spare, you might like to volunteer at Ceredigion Archives. Have a look at our Volunteers page.